Several schools leverage federal, state, local, and private funding to improve technology. Most have implemented their technology plans which range from providing each student with a digital device to equipping each classroom with an interactive white board or desktop computers. To fully realize the benefits of these technologies requires teachers to redesign their instructional strategies including participating in technology focused professional development and administrative support. This chapter examines the impact of technology integration on student learning outcomes and reviews a framework for the integration technology in the curriculum. Portable computing devices such as smartphones and tablets that have access to the Internet through a cellular or Wi-Fi network (Grant, Tammin, Brown, Sweeney, Ferguson, & Jones, 2015; Reeves, Gunter, & Lacey, 2017) are becoming increasingly ubiquitous in society particularly with the current generation of students (Grant et al., 2015; Sharples, Kloos, Dimitriadis, Garlatti, & Specht, 2015; Wright & Parchoma, 2011). Personal ownership of mobile devices continues to increase with the percentages of youth ages 2-17 owning smartphones increasing from 23% in 2011 to 37% in 2012 (Levene & Seabury, 2015). This generation often called digital natives have grown up with the Internet, computers, cellphones, and other digital media integrated into almost every sphere of their lives (An & Reigeluth, 2012). Digital natives are accustomed to receiving information rapidly; can parallel process and multi-task; prefer viewing graphics before text; and function best when networked. These learners require the integration of technology to be actively engaged in their learning. According to the National Center for Education Statistics (NCES), in 2013 about 71% of the U.S. population age 3 and older used the Internet (United States Department of Education, National Center for Education Statistics (NCES), 2016), while the United Nations Educational Scientific and Cultural Organization (UNESCO) gives the number of people having access to a connected mobile device at over 6 billion people worldwide (UNESCO, n.d.). These and other developments have led to an increased emphasis on the integration of technology into the k-12 classroom in an effort to encourage learner engagement (An & Reigeluth, 2012). Technology integration in the classroom has the potential to support important educational goals and enhance the acquisition of higher order thinking and problem solving skills (U.S. DOE, 2016). O’Dwyer, Russell, Bebell, and Tucker-Seeley (2005) found a connection between technology, achievement, and motivation; students and teachers tend to be more engaged and interested when technology is an integral part of teaching and learning. 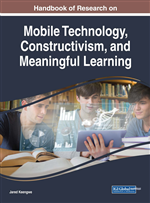 This chapter aims to provide a useful reference point of published research on mobile learning and the influence of mobile technologies on student learning outcomes. Although there have been many promising learning opportunities, there continues to be a need for empirical evidence supporting the effectiveness of mobile technologies in specific areas of student achievement. This is especially critical as schools begin to consider “bring your own device or bring your own technology” as a feasible alternative to providing school-owned mobile computing devices for every student (Grant et al., 2015), and seek ways to comply with new state mandates and access to digitized learning resources. As modern day classrooms become more technologically enhanced, and schools struggle to keep up with the latest gadgets, technology remains a tool to be used to deliver the content and not the content. Good teaching with technology remains informed by the relation and interaction among and between content, pedagogy, and technology (Koehler & Mishra, 2009). See Figure 1 - a concentric depiction of the interaction of the three core areas of knowledge and the resulting Technological Pedagogical Content Knowledge (TPACK). The TPACK framework (Koehler & Mishra, 2009) provides a structural basis that can be used to plan for technology integration. Information Literacy: A set of abilities requiring individuals to recognize when information is needed and have the ability to locate, evaluate, and use effectively the needed information. Digital Equity: Refers to equal access and opportunity to digital tools, resources, and services to increase digital knowledge, awareness, and skills. Digital Literacy: The ability to use information and communication technologies to find, evaluate, create, and communicate information, requiring both cognitive and technical skills. Information and Communication Technologies: Refers to all the technology used to handle telecommunications, broadcast media, intelligent building management systems, audiovisual processing and transmission systems, and network-based control and monitoring functions. Mobile Device: A handheld computing device, such as a smartphone or a tablet. Mobile Application: A program designed to work on mobile devices. Mobile Technologies: are defined as all those technological devices, which are portable and lightweight and either through the data cables or through wireless connections have Internet capability such as mobile phones, PDAs, iPads, and smart phones.